Holy Trinity is a welcoming, loving, serving community of Christians and friends. We believe “come as you are, whoever you are” best describes us and our worship style. We are defined by our depth of spirituality, our support for one another as God’s children, and our commitment to outreach in the community with acts of kindness and support for the needy. We believe that no person should ever be denied full participation in the body of Christ because of how they identify, who they are, or who they love – everyone is welcome! Here are a few testimonials from parishioners. Our worship: Worship style is informal, and we hand out bulletins to help you follow along. We are not a mega-church – instead we enjoy a close-knit fellowship sharing meals, prayers, and love for our neighbors. We want you to join us in your faith journey! Our 8AM Sunday service is approximately 40 min without music (quiet service), and is followed by a home-cooked hot breakfast (continental in summer months). Our 10AM Sunday service is more traditional, lasting about 60-75 minutes, with readings, music, choir, and nursery care for Pre-K and infants in an adjoining room. We offer a quiet, simple healing service Wednesdays at 6:30 p.m that lasts 30 min. Sunday School / Youth Christian Formation: a blended program of mixed-age activities where young and old participate alike. Throughout the year, youth Sundays are held where children handle most aspects of the service, and sometimes skits and plays. 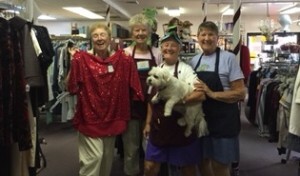 Holy Trinity Thrift Shop is open Mon – Sat 10AM – 4PM, The thrift shop proceeds help serve our parish and a variety of nonprofits in the community. It is managed by a part-time manager and assistant manager, with many volunteers helping throughout the week. Some of our volunteers have been with us for over 14 years! Our thrift shop will be moving in late January 2019 to the Parish Hall, but our need for volunteers will certainly continue. The future is bright and our congregation continues to show flexibility. In Feb, 2019, the church sold the South portion of the property to a medical practice, which housed the Thrift Shop and the former Parish House. In February 2019, the Thrift Shop moved temporarily to the Parish Hall. All aspects of church operations remain the same. Holy Trinity envisions new and creative ways to use the sanctuary and breezeway spaces, while staying true to our worship traditions. Holy Trinity will continue bringing hope and healing to our community through Jesus Christ, comforting and equipping God’s people, and serving the needy. We hope to hear more little voices in our sanctuary – we love the sound of children during worship and we are a breastfeeding-friendly place! We will continue to love one-another and the world, to the glory of God the Father, Son, and Holy Spirit. We continue to grow the Body of Christ and share His love with others. Holy Trinity began in 1983 when a handful of people gathered at Curlew Creek Elementary school under the auspices of St. Alfred’s Episcopal Church. Several families from St. Alfred’s seeded the congregation on McMullen Booth Road to serve the north Pinellas County community. In 1984, the Diocese purchased property for Holy Trinity, which included a house that was renovated for worship and office use. Membership grew and several Vicars succeeded each other for the first few years. In 1989, Fr. Joseph Diaz arrived. There were 35 active members at the time. The charge of the Vicar was “to grow it, or close it.” By October 1989, we had outgrown the space in the house, and on Christmas Eve of that year, we began worship in a modular building installed on the property. The building was often filled to capacity as membership rose dramatically. In 1990, additional property adjacent and north of the current buildings was purchased. By 1991, we had outgrown the modular worship spaceso a larger modular was installed with seating for 250. At the time, the original house was utilized as a Parish Hall, Sunday School, and office space. In 1993, Pinellas County took by eminent domain a portion of the roadway to the east of the property which took much of the parking area from us. For 16 months, the congregation was shuttled by bus from the hospital parking lot across the street. Holy Trinity continued to grow. In 1994, a Building Committee was formed to look at building a permanent church building. Plans were finalized by the following year, and funds were secured via a Capital Campaign to retire the debt in three to five years. Construction began, and the worship space was consecrated in 1997. The modular buildings were converted to a Parish Hall, Sunday School and Youth Group space. In 1998, Holy Trinity officially became a Parish with plans for a Parish Hall and Education Center. Construction on the Parish Hall began in 2001. The Hall was dedicated in 2002. The modular buildings were rented out to a private school from 1998 to 2004, and the house again served as Sunday School, Parish Hall and office space. The Thrift Shop, opened off-site in 1995, was relocated to the modular buildings on property in 2004, and a PreSchool rented space in the Parish Hall. The independently-run PreSchool relocated in 2016. 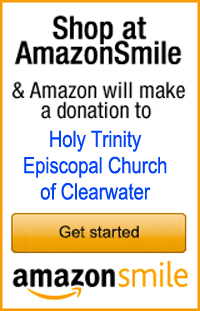 Holy Trinity is part of the Clearwater Deanery – one of 14 Episcopal churches serving under the direction of The Diocese of Southwest Florida, whose 77 congregations total some 36,000 baptized persons who share in many exciting ministries and missions. On any given Sunday, about 17,000 people worship in Episcopal churches throughout the Diocese. The Diocese extends along the coast of the Gulf of Mexico, with our northernmost congregation in Brooksville and our most southern in Marco Island. We include the cities of Tampa, St. Petersburg, Sarasota, and Fort Myers. Our easternmost congregations are in Plant City, Arcadia and LaBelle.